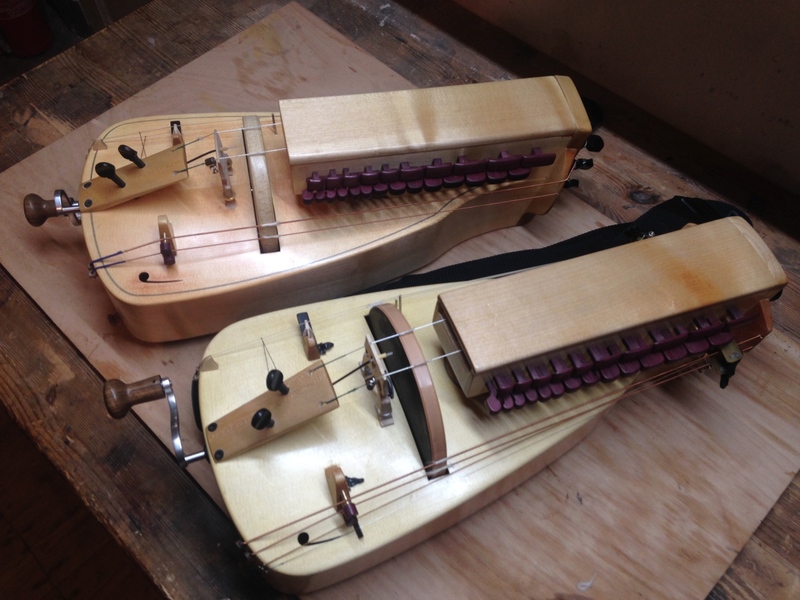 The first two instruments from this winter’s series are now for sale. The new design is an evolution of my previous instruments, aiming to be more compact whilst having a loud, mellow, balanced sound. The instruments fit nicely in Ritter Alto/Tenor sax bags (I’ve flown several times with this model as hand luggage without any problems). This instrument can be seen played together with a violin in this video from Folk Marathon 2016. Fitting capos and/or an amplification system is also possible. Both instruments are now sold, but I may be available for new builds over the next year, Contact me at barnaby@waterpigs.co.uk if you’re interested. Interested? Questions? Contact me at barnaby@waterpigs.co.uk for more information. 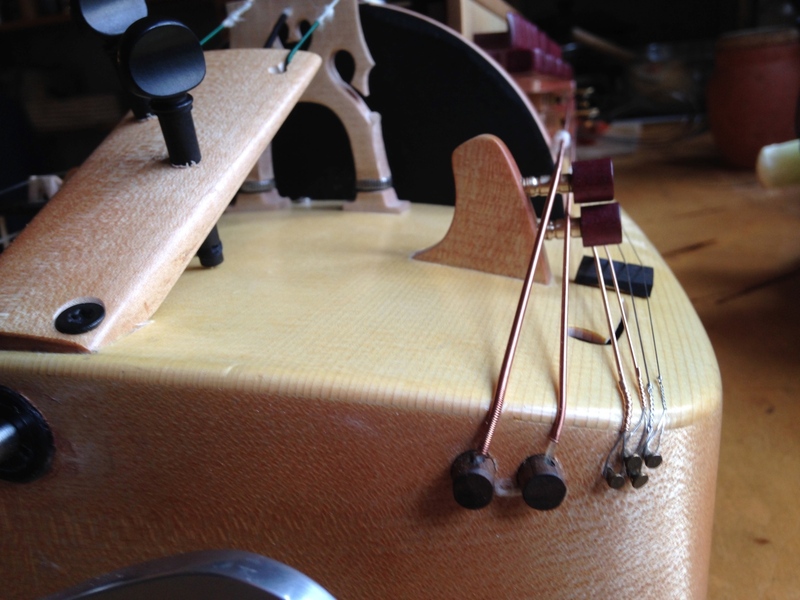 The instrument has three chanters (currently G, d and g), two drones (currently C and G) and two trompettes, also C and G. The C drone and trompette are fitted with capos, raising the pitch by one tone. The chanter bridge height is adjustable. 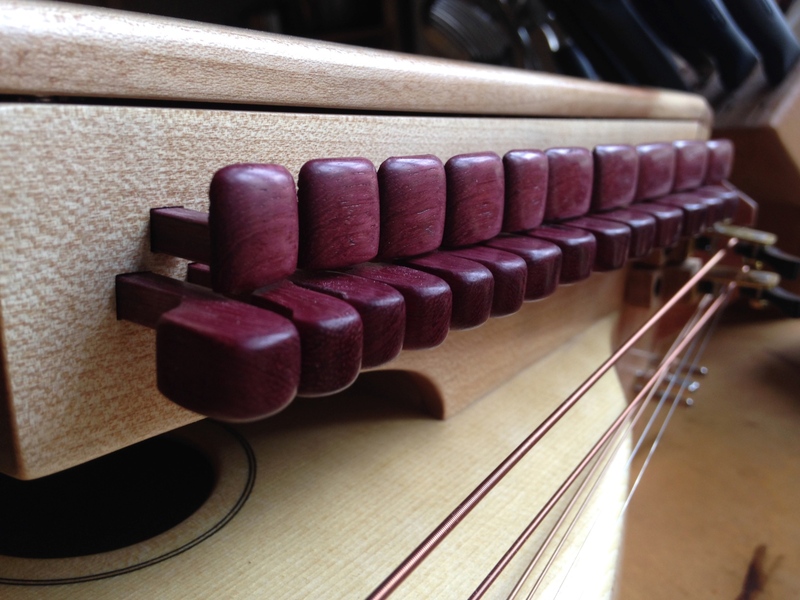 The instrument is fitted with two passive internal pickups, one on the soundboard below the bridge giving a good overall sound, and one on the chanter bridge itself, giving a very focused chanter sound (almost no trompette!). The sounds from both pickups can be heard in the video. There is one jack for each pickup, enabling you to mix them or apply separate effects externally. The whole body is made from flamed maple, the keys and other small details are ebony, with screwed wooden tangents. The instrument is a prototype, and therefore has some minor cosmetic and design flaws; otherwise it is a fine, working instrument at a special prototype price. I’ve already had some interest in the instrument and am waiting until Monday for a potential buyer to get back to me, other than that it’s first-come-first served. Any questions, etc. 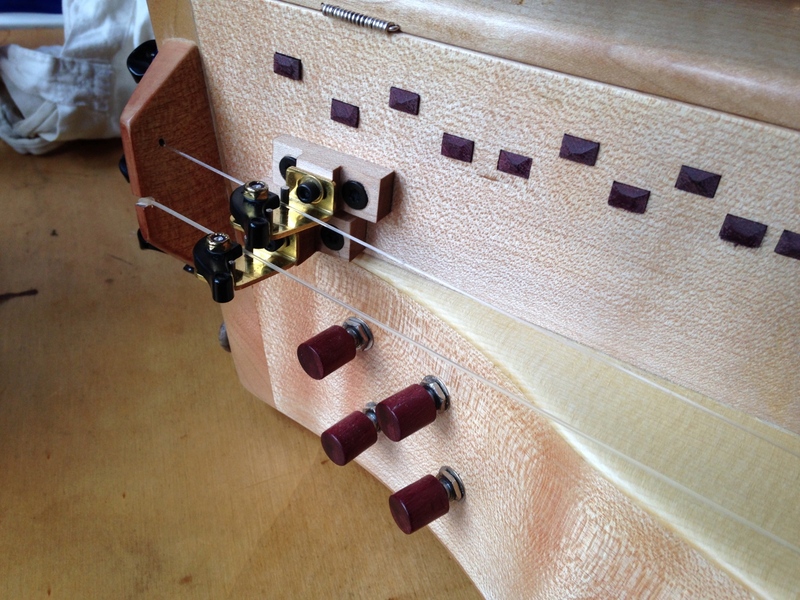 comment/message/email me barnaby@waterpigs.co.uk2016-10-18 this instrument is now sold to Isarnos in the UK — looking forward to hearing what they do with it! I’m currently building more instruments, drop me an email if you’re interested. For more, there’s a compilation.